Will Any Gun Do In a Gun Fight? 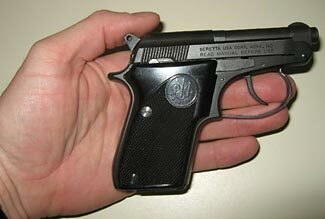 The Beretta Bobcat (Model 21) is available in .22LR and .25ACP calibers. It surely is a tiny pistol, but would you bet your life on it stopping a vicious attacker? It is strange how things occur in cycles. We talk with gun owners and intending gun owners pretty much every day, and from time to time we get a run of people all saying the same thing. This week it has been people with or wanting to buy teeny tiny pistols. Revolvers and semi-autos chambered for .22 LR or .25 ACP or .32 ACP – rounds which we seldom see in a self defense gun these days. Well, yes, I know it isn’t a very powerful caliber, but it is convenient and small, and I figure it is better than nothing. Surely the size of the gun doesn’t matter as much as simply having any gun at all – just having a gun of any size will save you from an attack. After all, what kind of crazy person wants to be shot by anything? It would surely hurt like hell! They then look at us, complacent and content, seeking our affirmation, but all they get is a look of ‘intelligent uncertainty’ in return. If they’re buying our training services, then we’ll try and correct their misapprehension. Now – don’t get me wrong. Kinda, sorta, it might be true that any gun is better than no gun at all, and again, kinda sorta, even a .22 or .25 round might hurt like hell. Indeed, Front Sight has a slogan ‘Any gun will do, if you will do’. And you’ve probably also heard the saying ‘It isn’t the size of the dog in the fight, but the size of the fight in the dog’. Both these statements are anchored in truth. If you can maintain a confident non-victim posture, and if you can present your tiny gun authoritatively and assertively, your demeanor and bearing will magnify the perceived threat of the pistol. But if your body language betrays fear and incipient submission, even the biggest gun will struggle to compensate for the non-verbal messages of failure and defeat you are broadcasting to the other guy(s). So, for sure, a small pistol, well managed, is definitely a good thing. But. And hear me out on this, please – particularly if you are thinking the same way these others have been thinking. If having one of those tiny little pea shooters gives you a false sense of confidence and security, then it is more dangerous to have it than to not have it. Even those of us with really big guns understand that any caliber of round fired through a pistol is inadequate and unlikely to guarantee an immediate end to an attack – see our recent article about how often and where to shoot an attacker. Your safety is best protected by adopting an alert, aware, and defensive posture in your daily life. You don’t want to develop an over-confident swagger (unless you have a Barrett slung over your shoulder and a squad of Seal Team 6 members backing you up). So, the first concern about people armed with a tiny pistol is that they may become over-confident and over-reliant on the ‘protection’ that their pistol offers them. Let’s now consider exactly the nature of the protection they are relying on. These tiny pistols have two things in common, no matter the make, model, or caliber. First, they have very few rounds in their magazine or cylinder – typically five or six. Second, changing magazines or reloading a revolver is often less quick and convenient than for a larger size pistol. In other words, you’re unlikely to have a chance to reload in the middle of a situation – you’re going to have to prevail with what is in your gun to start with – a very small number of very small rounds. Which brings us to the really big question. Will you need to start shooting or not? There you are, confronted by an attacker intent on doing you harm, and you pull out your tiny little pistol and say ‘Stop or I Shoot!’. Does he stop? I’ll guess that probably three quarters or more of the time, with a regular sized pistol, the bad guy will give up or run away at this point. But with a smaller pistol? For sure, you better hope he does, because if he doesn’t, you’ve very little chance of taking him down with whatever it is you’re clutching in your hand. True, any gun is still a gun and potentially lethal. But put yourself in the bad guy’s shoes. He is probably somewhat familiar with pistols, and in general will have been around medium or full frame semi-autos, or revolvers in .38 SPL caliber or larger, be they snub-nose or longer barreled. So he looks at you in what may be dim light, and what does he see? Maybe he sees the glint of metal in your hand (this is one time when you want your gun to be highly visible – normally we like our guns to be matt black), but maybe he doesn’t even see it, due to it being so small, the light being poor, and your hand being relatively so large. What does he think if he does see it? He sees something maybe one quarter the size of guns he is familiar with. What would you think if someone pointed a gun at you that was one quarter the size of a ‘normal’ gun? Chances are, your first reaction would be ‘Is that real, or is it a child’s toy gun?’. Now imagine that you’re a big burly bad guy, and your victim is a frail elderly gent or perhaps a slim woman weighing no more than 100 lbs. You both know that you have total physical dominance as a given. Chances are the bad guy will find it hard to switch mindsets from being maybe two or three times the weight/body mass of your victim-to-be and completely confident in being able to do whatever you choose to that person; to now backing down in abject fear due to some tiny little thing that could even be a toy gun in their hand. Some bad guys will sneer and laugh at you with your tiny gun. For sure, a regular size gun held in a confident and competent manner, and by a middle aged average sized averagely fit male is a threat that many (but not all!) bad guys will think twice about. But a teeny tiny little thing in the hand of a massively weaker opponent? Think also about what if there are two guys confronting you (maybe one lurking behind you, currently unseen)? This means also the guy facing you down will face an embarrassing amount of ‘loss of face’ from his peers subsequently – ‘Did you hear that Tommy ran away from a little old lady with a tiny .22?’ sort of thing. This is all guesswork, but my guess is there is a significant risk that a bad guy will call your bluff in such a situation, and you’ll be forced to use your little pistol. What do you think? A large risk, a small risk, or an absolute ironclad certainty that of course the bad guy will back down at the slightest sight of your gun, no matter how small it is? Now, you need to understand something very important. The best possible outcome in any case like this is for the bad guy to back down and run away, without you needing to fire a shot at all. Which gun is more likely to scare a would-be attacker and get him to leave you well alone? A tiny one, or a normal sized one? So people with tiny guns are more likely to need to use them than people with bigger guns, and please please appreciate – no matter how justifiable any shooting may be, the personal, professional, legal and emotional consequences of shooting anyone, in any situation at all, will be close to overpowering. Your life will change profoundly, and not for the better, if you ever need to shoot someone. For this reason alone, I’d argue for getting a bigger gun. The bigger the better (just so long as you can conveniently keep it with you, everywhere, all the time). Please keep reading – there’s still more (if you’re convinced, you may stop reading, but only if you promise to rush to the gun store right now and get a bigger gun). Let’s next consider what happens if you have to use your teeny tiny gun. Hopefully it will make a fairly loud noise when it is fired, which might persuade the attacker that it is a real gun and to be taken seriously. But will it stop the attack? Go back and read again our article about how many times to shoot an attacker – an article written from the assumption that you are defending yourself with a 9mm or larger handgun. If it takes four rounds of 9mm to stop an attack, how many rounds of .32 or of .22 ammo will be required? The next thing to worry about is how many of your shots will actually hit the attacker (remember you only have five or six in total to see you through the fight, so you’ll be beating the odds if you hit the attacker twice – more probably, you might hit him once or possibly even not at all!). And the ultimate issue – what effect will your hits have on the bad guy. Here’s one scenario : You shoot at the bad guy and he thinks ‘That fool is shooting at me and – owwww! – oh, actually, that didn’t hurt much at all, it truly is a child’s toy gun, but now I’m going to have to teach him a real lesson for shooting at me’. Let me put it another way. I’d not bet my life on the hope that even if all five or six or seven shots landed on the bad guy, this would be sufficient to take him out of the fight prior to him getting in physical contact with me and doing whatever he chose with a knife, his bare hands, or whatever else. Remember also that as likely as not, you might be confronted with two bad guys. There’s no way that five or six or so rounds of under-powered ammo is going to help you prevail in that situation. One more thought. What say the bad guy pulls out his own gun? If you’re both staring at similar sized guns, you’ve a bit of a stalemate and either you start shooting or else neither of you shoot and you both back off. But if he has a 9mm or .40S&W with maybe 15 or more rounds in his magazine, and you have a .32ACP with six rounds in your magazine, who do you think is going to prevail in that encounter? In other words, when he draws his gun, many people will then surrender (this is probably a mistake, but they’ll do it all the same). All you’ve done is make the situation worse. I’ve been asking you quite a few questions in this article. Let me close with one final question : Are you willing to bet your life that your teeny tiny little popgun will guarantee your winning a deadly encounter with one or multiple attackers? Because, after all, that truly is what you’re doing, isn’t it. I’ll give the situation my best effort if I’m armed with my trusty 1911, or even with a modern double stacked 9mm or .40 pistol. But press a little .25 pistol in my hand and the only person who’ll be upset by that would be a security screener at the airport. We’ll talk more about the minimum caliber/capacity handgun you should equip yourself with another time, but the short answer is to go for a .38 SPL or .357 Magnum in a revolver, or a .380 or (much better) 9mm as the minimum caliber in a semi-auto. How Often – and Where – to Shoot an Attacker Are You Prepared in Your Home – Possibly The Most Dangerous Place You’ll Ever Be?